A man has been arrested after reports of residents being threatened with a suspected firearm in Northumberland. Reports came in to police just after 6.15pm yesterday, when a man was seen getting out of a vehicle on Renwick Road, Blyth, carrying what was believed to be a firearm. Further reports were made to police about the man threatening members of the public and firearm officers were deployed in the area to trace the man. Those inquiries have been continuing today and now a 31-year-old man has been arrested in connection with the investigation. Chief Inspector Helena Barron, of Northumbria Police, said incidents of this nature are extremely rare and a full investigation is under way. 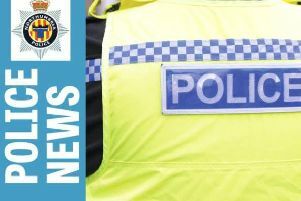 She said: “There will be an increased police presence in and around Blyth to carry out house-to-house inquiries, so if anyone has concerns we would encourage you to speak to our officers. “We recognise that this incident could have caused a lot of fear in the local community, but this is being treated as an isolated incident and nobody has been injured. “Blyth remains a really safe place to live and residents should take reassurance from the fact that incidents involving firearms are not common here. Any witnesses, or anyone with any information, should contact police on 101 quoting log 850 08/04/18, or Crimestoppers anonymously on 0800 555 111.